The goal of PICPs is to mimic, if not improve upon, a site's predevelopment hydrology by retaining as much stormwater as possible in the base/subbase, so that it can infiltrate back into the ground. PICP is considered a Low Impact Development (LID) Best Management Practice (BMP) for stormwater management. As a distributive infiltration practice, PICP conserves space by providing a functional pavement and Stormwater Control Measure in one system. Various methods are used to model the site hydrology and calculate runoff calculations such as flow rates and volumes. Depending on the hydrology model used, a curve number or a runoff coefficient is needed to represent the PICP site condition. 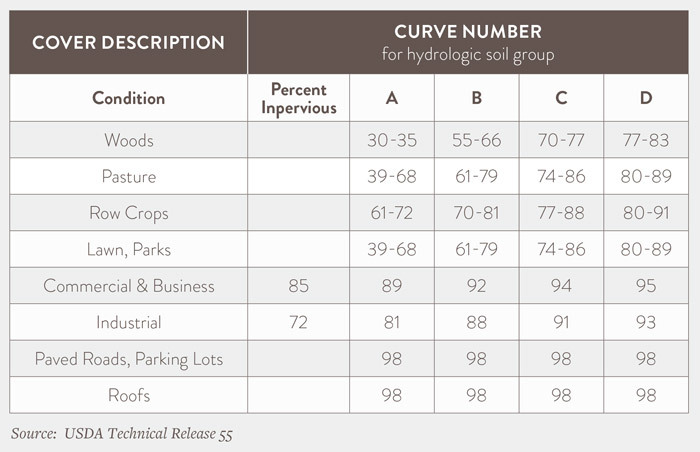 The Natural Resources Conservation Service (NRCS) method characterizes site runoff based on hydrologic soil type, land cover and amount of rainfall using a parameter known as a curve number (CN). Curve Numbers predict direct runoff from rainfall excess, and can range between 30 to 100, with lower numbers indicating lower runoff potential. Caution should be applied when using CNs for permeable pavement. Results can underestimate stormwater runoff in small watersheds (under 5 acres) for small storm events (below the 2-year storm), so for these cases, calculations should be verified by another method. Sample CNs per USDA Technical Release-55 are listed on this page. However, traditional hydrologic modeling requires CN modifications to properly model permeable pavement to account for reservoir storage. CNs for PICP systems can range anywhere between 45 for A soils to between 70-80 for D soils. What is the Stormwater Runoff Coefficient (C) of the PICP System? C represents the percentage of rainfall that becomes runoff based on the surface type and is used in the Rational Method to determine peak flow rates. This runoff calculation is overly simplistic and does not account for rainfall intensity, duration, or reservoir drainage. A C value of between 0.25 and 0.40, depending on subgrade permeability, is appropriate for PICP systems when using the Rational Method. Correctly designed, installed, and maintained, PICP systems have surface infiltration rates higher than that of almost any natural soil, and several times greater than the maximum possible rainfall intensity. This is why a PICP surface should be given complete credit for “100% perviousness,” as would a meadow or forest. PICPs can detain or retain water quality volume through storage in the aggregate base and subbase. Most design storm requirements are easily controlled in the underground reservoir created until the subgrade soils infiltrate the water or until underdrains release the volume at a controlled rate.